Also available in mens sizes, code TRF532. Fleece cuffs. 2 zipped lower pockets. Adjustable shockcord hem. Shaped fit. Also available in mens sizes, code TRF532. Weight: 280g/m. 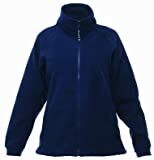 Fabric: 280 series anti-pill Symmetry fleece. 10 (34: To Fit (ins)). 12 (36: To Fit (ins)). 14 (38: To Fit (ins)). 16 (40: To Fit (ins)). 18 (42: To Fit (ins)). 20 (44: To Fit (ins)). A comprehensive range of promotional and corporate clothing suitable for the great outdoors, at surprisingly competitive prices. This entry was posted in Gothic Discount Clothing and tagged Colours, Fleece, Jacket, Thor, Women's by Vivid Dark. Bookmark the permalink.